Have you ever heard of a person who is in a state of whelm? Mostly, we hear about crazy, busy, overwhelmed lives or being underwhelmed. Whelm seems like it should mean balance, a state of being to strive for. 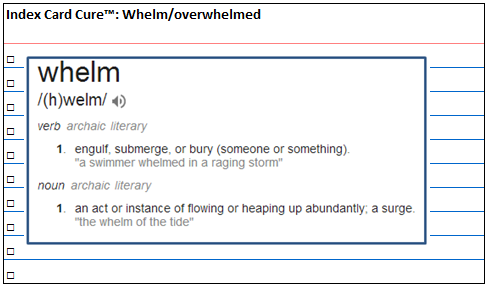 While whelm may be an archaic word, it certainly describes many people’s daily lives. 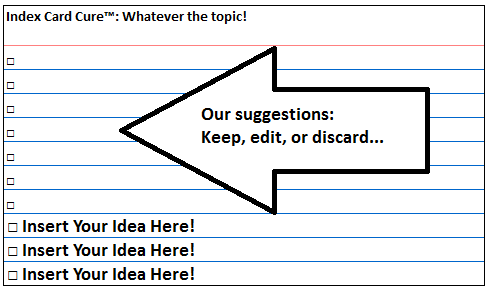 With Index Card Cure™, we suggest a discrete number of actions about specific topics; not just skimming the surface, but hitting the essentials. Even complicated subjects are manageable if divided into small increments. There are things we know we should do, that we are not doing, and that keeps us in a state of low-level anxiety. The Heartbleed bug exposed security lapses of sensitive data. We know that we should do a better job managing our online presence. But, if you are not being told by your office IT person to make passwords a certain length with specific characters and change them at a certain frequency without using the previous 10 iterations of passwords, does it happen? How many use the same password for multiple sites and store passwords in computer files or written on lists. Every report of another security breach adds to the anxiety of wondering if we’re vulnerable to getting hacked. In addition to the proposed steps on each index card, there are two or three blank lines. These blanks allow you to modify the index card for your specific needs. We want the Index Card Cure™ platform to give a starting point that you can personalize for your needs. Too many steps = too hard. And too hard means it doesn’t get done. It’s too easy to put off a complicated project. How many excuses can you come up with to not clean and organize the basement: too big, too hard, too much time, the sun is shining? If you have suggestions or edits for one of the cards, please leave a comment. Together we can improve the Index Card Cure™. Yes! Finally someone writes about empire online college. rather dull with practically no privacy. With all the new advances in technology- that is simply just not the case anymore. Over the years, glass manufacturers have come up with various types of glass like double glazed windows and patterned glass. You can use glass doors for your bathroom, patio and other places at your house to give your home an ultramodern or elegant look and feel. is indeed possible. There is no shortage of choices in terms of glass design. during summer and a warmer effect during winter or autumn. You also save money in terms of utility bills. Another benefit of using glass doors and windows is that it just makes your home brighter and more cheerful feeling. a particular place since there is sufficient natural light. the stains. Place a doormat which helps in reduction of mud or dirt entering through footsteps. cleaned regularly. The surface can be vacuum cleaned every day or just sweep it. mopping. One can make it at home by mixing vinegar and water. broom can be used. Plain water or the special ceramic tile cleaners can be used for the wet mopping. Never use harsh floor cleaners. Sweep or vacuum clean. After using any floor cleaner use a dry mop to soak any type of liquid residue. mildew or mould in the damp areas like bathrooms. It is best to have a seal (colour or clear) on the grout which will not only protect the surface but also acts as an anti-fungal agent. grout cleaning; the grout sealing is also done if ordered. air conditioning during hot summer days in any way. The true secret to reducing Air Conditioning costs lies in your maintenance activities and making the right purchase of air conditioner units based on your needs. and window on the US market. Each kind has its own pros and cons. units on the market require the same kind of maintenance. Apart from the high expense of purchasing this system, there are the possible high costs of repair and maintenance. one room to another easily enough. take up space in the room like how the freestanding type would. When it comes to the window type, you have the choice of selecting one that comes with or without duct. to cover the space for your entire house instead of buying a centralized unit. Normally, the frequency for changing or checking the filter will be mentioned in the air conditioner manufacturer’s manual. hot water heaters, or fitting new faucets in bathrooms. which they could perform themselves. Nonetheless, considerable precision and expertise is needed to implement the majority of plumbing tasks. cause leaks that result in expensive water damage and high water bills. end up making the problem even worse. water tank. Leaks can appear anywhere in your system, due to a range of factors. water pressures from wells or city supplies, and water line blockages (such as debris or rust). a plug in it that leads out to the primary sewer. Frequently, this is caused by tree roots. sewer lines or drain. Contact a drain cleaning company or plumber. of your old heater too. have to interrupt your regular schedule. case you need a plumber. Even if your pipes don’t have cracks in them, hiring a plumber still might be sensible. Rather than thawing frozen pipes, some plumbers just replace certain sections of them. Any kind of plumbing problem can represent a threat to property or health. Therefore, these problems need to be addressed straightaway. or fitting new faucets in bathrooms. On the internet, there is information about how to do many kinds of plumbing jobs. to implement the majority of plumbing tasks. you might end up making the problem even worse. can involve thermocouple ignition systems and burners. Issues with electrical heaters can involve heating elements, bad overload switches, malfunctioning thermostats, and blown fuses or circuit breakers. In all likelihood, if you encounter a sewer line stoppage, the line will have a plug in it that leads out to the primary sewer. Frequently, this is caused by tree roots. Large sewer rodding machines can be rented, however they might harm the sewer lines or drain. Contact a drain cleaning company or plumber. your storage area, connect it and ensure that it functions correctly. plumbers just replace certain sections of them. to be addressed straightaway. Locate some good plumbing repairs services, and contact them if you encounter any of the above situations. there is information about how to do many kinds of plumbing jobs. maintenance or repair work, which they could perform themselves. Nonetheless, considerable precision and expertise is needed to implement the majority of plumbing tasks. in expensive water damage and high water bills. Leaks could cause mold to develop in your house as well. If you don’t do this, you might end up making the problem even worse. bad overload switches, malfunctioning thermostats, and blown fuses or circuit breakers. Examples include badly designed supply lines, low water pressures from wells or city supplies, and water line blockages (such as debris or rust). problems, they will do the repair work. Ideally, you should avoid trying to install a new heater on your own. A good plumber will transport the new heater to your storage area, connect it and ensure that it functions correctly. don’t have to interrupt your regular schedule. a threat to property or health. Therefore, these problems need to be addressed straightaway. There are many types of tiles available nowadays. The method of tile cleaning will depend more on the tile type. helps in reduction of mud or dirt entering through footsteps. can be used. Plain water or the special ceramic tile cleaners can be used for the wet mopping. grout which will not only protect the surface but also acts as an anti-fungal agent. tiles, number of tiles and size of the tiles to be cleaned. possible. Vacuum clean the tiles every day or a simple broom can be used. can be used for the wet mopping. made of stones as they are natural minerals. Never use harsh floor cleaners. mop to soak any type of liquid residue. goes simultaneously. Grout is porous in nature and attracts dirt, grease etc. However there are couple of things to be followed to add the sheen and glow of the tiles. for the mopping. One can make it at home by mixing vinegar and water. using any floor cleaner use a dry mop to soak any type of liquid residue. to regularly clean the grout, i.e. the lines between the tiles. depends on the type of the tiles, number of tiles and size of the tiles to be cleaned. however great topic. I must spend a while learning much more or understanding more.